Tobias Wolff stories are fun to read at all times, but they really jump to life when performed by Word for Word Theater Company. 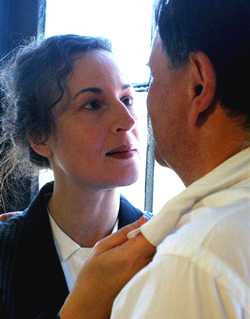 The short run at the Julia Morgan of three Wolff short stories ends on Sunday March 22, after which the company is taking its show on the road for a two week run in different cities in France. The French will love Stephanie Hunt's jaunty hat and Michelle Pava Mills's big brown boots in the opening piece, "Sanity." Mills must have been April once, or maybe she still is, to channel the young girl's clodhoppery walk so perfectly, as opposed to Hunt's assured and measured pace as Claire, April's stepmother. "Sanity" is followed by "Down to Bone," where Paul Finocchiaro is forced to watch his mother waste away in a nursing home. Mills has a beautiful cameo role in this one as a bright red Miata, and Jeri Lynn Cohen is a very pleasing Elfie, the funeral director who says to Finocchiaro: "I have my momentary weaknesses, and I think you may be one of them." But this is all cake. After an intermission we get the ice cream: Wolff's "Firelight." 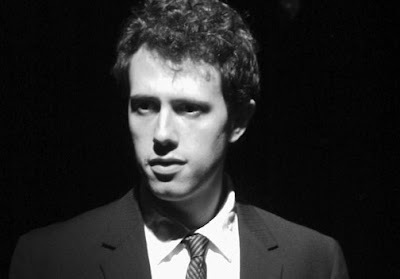 Anthony Nemirovsky plays the young teenage son of Cohen, as Mom and Son spend their weekends looking for apartments in the college town in whose outskirts they are currently residing in a cheap boarding house. They can never afford these apartments, and have no intention of actually moving into any of them, but then they come to the current home of Dr. and Mrs. Avery, played by Finocchiaro and Hunt, and their daughter (whose name is Sister), played by Mills. Oh, what a heartbreaker. We really want Mom and Son to take that apartment. Son lies down in front of the fireplace next to Sister and we get to see his life change before his eyes, as he glances through the fire into a future where there are actual possibilities instead of dead ends. Ah, but life is never that simple. It's a fulfilling evening of theater, one in which you get to see the power of performance blend seamlessly with grand literature. Word for Word and Tobias Wolff are meant for each other. Can it be a coincidence that Wolff, Word and Word all start with 'W'? The San Francisco Theater Blog Awards Division awards "More Stories by Tobias Wolff" one star for each story and a BANGLE OF PRAISE for Michelle Pava Mills's red Miata. An extra half star is given for Anthony Nemirovsky's two voices, both so believable, in "Firelight," and for his perfect teenage awe when he sees Sister in front of the fire and says: "She had breasts!" Yes, Anthony, and in the previous story she also had a steering wheel. Word for Word: "More Stories by Tobias Wolff"
"The Story" makes you sick. It also makes you think, keeps you on your edge of your seat and is one of the best shows we've seen all year. The reason Tracey Scott Wilson's no-hero tale gives your stomach such a jolt is that it is so honest. The fictional big city newspaper is a den of jealousy. There has been a murder downtown, where a white school teacher has been shot by an unidentified (assumed) black assailant, and now there is a rush to tell the story and assign blame. The problem is that everyone has an agenda, including all the editors and reporters at the paper. At first you can't help but dislike Pat (played brilliantly by Halili Knox), the editor of the newspaper's Outlook section, which is where all the "black" stories get placed, because she is self-centered and cruel to Yvonne (the equally brilliant Ryan Peters). The author makes you like Yvonne better, because she is pretty and seems more centered, but you make a bad choice. Likewise you want to like Jessica Dunn (Rebecca Schweitzer), the wife of the murdered teacher, because she's a victim, but there is the problem of her obvious racism; and you really don't want to like Neil or Jeff (Dwight Hunstman and Craig Marker) because both are so clearly on the make, but in the end...well. And poor Latisha. She is played to such perfection by Kathryn Tkel that you don't know which lie you like most. This is The Story's defining role. There is a lot going on here. There's that affair to hide, and racism is everywhere, including in the audience where Latisha snags us, along with Yvonne, when she says with exasperation: "I spoke to you in German and Italian but you still believed I was in a gang!" Yvonne bought Latisha's story and, sigh, so did we. Margo Hall's direction is flawless. By the time you realize you are watching a murder mystery you are hooked. And the ending is perfect -- nobody wants to lose their own little piece of the pie by exposing anything as trivial as the truth. 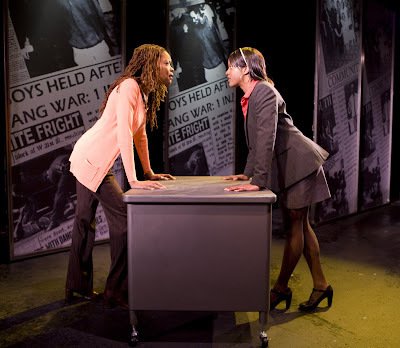 "The Story" is a first-time collaboration between the Lorraine Hansberry Theatre and San Francisco Playhouse. It's a match made on Sutter Street. We hope they do it again. 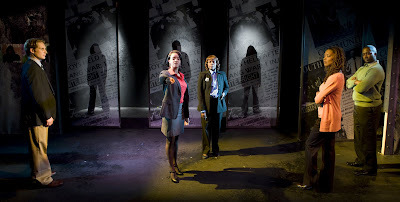 The San Francisco Theater Blog Awards Division awards "The Story" two stars for Tracey Scott Wilson's writing, which is mind-bogglingly concise -- this is a short, one-act play with no intermission but there is enough in it to keep you talking for days. All the major players in the cast are standouts, with Marker and Hunstman only a half step behind Knox, Peters and Tkel. Along with Hall's direction they earn another star and a half. But the element that takes this play and makes it a four star production is honesty. No one's feelings are spared. No one is a saint, they are just well-meaning people attempting to keep it real. And no one knows what that means. Don't miss "The Story." "Who is this Farrakhan? A schvartzer with a big mouth!" says Bob, one of the many characters inhabited by Charlie Varon in his latest one-man production "Rabbi Sam." Varon plays the clueless Bob, as well as Rabbi Sam, Sam's child Noah, a yoga-loving woman board member, a decidedly un-yoga loving Jerry, Sam's nemesis and head of the fictional Temple Beth Am's board of directors...and then comes Act Two and we meet Sarah Schimmel. Throughout Act One, we have been conditioned to believe Rabbi Sam is a visionary, a wild thinking rabbi who has come later in life to his calling, a man determined to shape a new future for his beloved Judaism. But when Sarah Schimmel, the widow of the old President of the temple, shuffles her bathrobe walk into Act Two, everything changes. As the deciding vote in the decision of whether or not to fire the new Rabbi, chain-smoking, gravel-voiced atheist Sarah becomes the truest voice of sanity in the temple's political wilderness. She and Sam and Noah appear to come to an understanding -- that in the end only one Commandment really matters: don't spend your life lonely. "Rabbi Sam" is brilliant in spots, though it drags a bit in Act Two. To this reviewer it seems as if Varon only gives lip service to Sam's flaws: perhaps he doesn't really buy them himself. Why does Sam decide to play politics at the end? Why is this suburban synagogue job so important to him, if, as is implied, he is independently wealthy? Sam's speech to the children at the end of Act Two, clearly a watershed moment to Charlie Varon, would have scared the pants off me if I'd been a kid forced to listen to it. A discussion with a rabbi at the conclusion of the play brought these subjects to life, but they should have come from Rabbi Sam himself. Perhaps, as the show develops, they will. 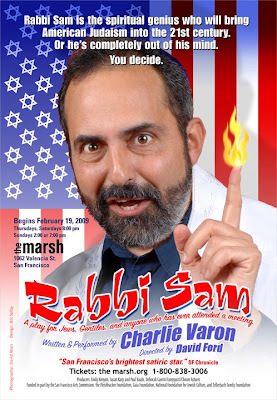 Make no mistake about it, Charlie Varon makes Jews howl and gentiles chuckle, and no one comes away from any of his shows without deep respect for the man's craft in solo performance. He and co-writer/director David Ford have helped develop the genre in San Francisco over the past 15 years (in collaboration with the Marsh) so we have come to expect miracles from them each time out. Is this show a miracle? Maybe not yet. But you will see "Rabbi Sam" and be glad you did. The San Francisco Theater Blog Awards Division awards "Rabbi Sam" three stars with a BANGLE of Praise. Charlie Varon and David Ford deserve a star each for writing, direction and performance. The BANGLE is for the brilliant story about the two scrolls. This introspection is where Rabbi Sam sparkles most brightly. There are several of these moments. We wish there were a few more. EXTRANEOUS COMMENT FROM THE REVIEWER: We saw two one man shows in two nights. For one we had no expectations and were taken by surprise. For the other we had great expectations that were only partially met. Both shows earned three stars. This is as much a statement about expectation as it is about art. A newcomer's slate is clean: we have no illusions about what he or she may come up with. But a veteran, whom we have seen many times, does not get to start clean. It is harder for him. The worst thing a performer can do is be brilliant in the past. Nothing less will satisfy us. There you have it. We reviewers are theater lovers but we are sharks. Our teeth sparkle in the moonlit sea. 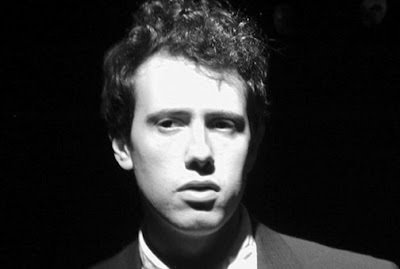 Jonathan Bock is a really good actor. 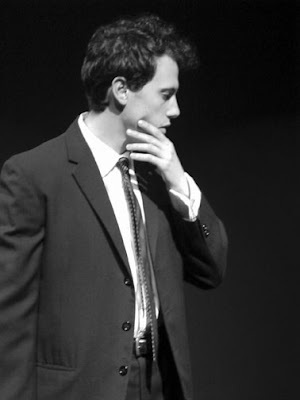 He stands in his rumpled dark suit, with red stains on his dusty black shoes, in the middle of the small, spartan stage at Exit on Taylor and manages, with no props, staging, music, lights or computer programs, to make us so uncomfortable we want to scream. The plot of Will Eno's 'Thom Pain (based on nothing)' is, well, it's about life. No. Death. No. Well, angst for sure, but it's not existential because if this were Camus the character would be speaking French and then he'd drive his sports car off a cliff. That's not what's happening here. They put the reviewers in the front row. When Bock stood in front of this reviewer, looked him in the eye from three inches away and asked: "Are you happy?" it was hard not to kick him in the shin. But that would have accomplished nothing. Yes. It would have. No. Just kidding. When Bock talks about his dog, who is electrocuted, the pads on her paws burnt off, or says, about himself "I'm the kind of guy you haven't heard from for awhile, then one day you never hear from me again," we're, like, whatever. Yes. No. The narrative of the story, a loosely-knit life-up-'til-now tale of chronic disappointment laced with the occasional doomed pleasure, intrigues us, rather than repels us, because Jonathan Bock is riveting on stage. Even in his long moments of silence, requiring an audience not to cough (some did) or laugh (some did) or shuffle their feet (we all did), we never stop thinking the story is going to explode, take off, veer madly into new territory. We're wrong. But remember, this is Exit on Taylor. Experimental theater. The author is going for sensation and grit, not plot. At one point Bock calls up a volunteer from the audience. The volunteer is placed in the middle of the stage and we expect him to become, well, utilized. But no. The poor man just stands there as Bock moves away from him and gives his most heart-rending summary of his life. We don't know whether to look at the emoting actor or the dumbfounded volunteer. When Bock concludes his monologue, he looks back at the volunteer and says "Are you still here?" You've got to love minimalism. Emily Greene gets credit for sets and Wendy Lynn for Costumes and Stephanie Buchner for Lights and Jess Thomas for stage design, but bear in mind there are no sets and no costumes and no lights and no stage design, except for that chair and that table with the pitcher of water on it, never used. One of Bock's last lines is: "I know this wasn't much, but let it be enough." He may be talking about the play, or his life, or the volunteer's experience on stage. Yes. No. Whatever. The San Francisco Theater Blog Awards Division is having a few fits trying to rate "Thom Pain (based on nothing)." It is really good, though it's a bit uncomfortable; it is also too long, though it's short (one hour, no intermission). Jonathan Bock seems born to the part, although he makes us squirm, although that's what the author wants, although we really should have kicked him in the shin. The last time we came to the Exit, a bum was peeing on our car when we went to drive home. This time: no pee. That's an extra half star at least. So we're going for Three Stars, half a star more than we thought when we left the theater last night. The play is good enough to suggest that you ought to see it. It grows on you. The more we think about it, the more we like it. See it and tell us what you think. "Thom Pain (based on nothing)"